Rumor: Titans Return Deluxe Wave 5? Discussion in 'Transformers News and Rumors' started by Hoffman, Feb 9, 2017. I have no idea if this info came out and got buried in speculation threads or something, but I have some info on the next wave of TR Deluxes. The new figures in this wave are Misfire, Twintwist, and Windblade. All retools. The other figure listed in the assortment is Wolfwire. No packout details. If this info is out there already, please delete this thread. Any idea what Windblade is a retool of? Yes please. This will do until there's a Masterpiece(ish) alternative. Did not see that coming at all. No problem, it's not often that I am able to share info first! Unfortunately everything I'm getting so far is limited to deluxe class stuff for some reason. 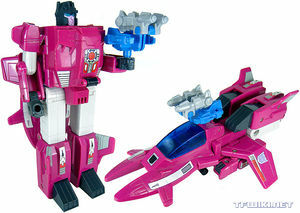 I mean, i cannot wait to have this big badass pink/magenta dude! Now i need Flywheels and Spinster. And I'm just supposed to believe some random post. Out of curiousity, what are the voyagers and leaders? Yeah, I need some proof before I can believe it. You're not supposed to. You can choose to or not. Makes no difference to me. TyrantGalvatron Hasbro is NOT your enemy. Do you sell retail TFs? For some reason I remember reading in another thread that you do. If so, that would definitely prove the credibility of your original post. can you tell us something about your source? Twintwist I knew would happen,Misfire's a happy surprise but Windblade is shocking. First rule abour sources, don't reveal said sources. Yes, I run a toy store an TFs are a small part of what we sell. This info came from a solicitation from a distributor. I was told the info was ok to share, however with how strict Hasbro has been with their solicitations, I'm still wary about how much info I should divulge. Windblade!? Oh hell to the yes! Ahem...I wonder how they'll handle her this time? Misfire? Yeah okay that is all levels of awesome and hopefully Wave 6 gives us Slugslinger so I can have the complete set. Twin Twist? I'm surprised to be honest. But hey CHUG Jumpstarters yay! Just hope I can pick up Topspin next time I stop at a Walgreens. Kind of sad there isn't a fourth guy but my wallet is going to be happy. But I'm honestly surprised by how excited I am, I just know these are going to be hell trying to obtain just like Kickback, Gnaw, Optimus, Megs, and the Wave 4 guys. 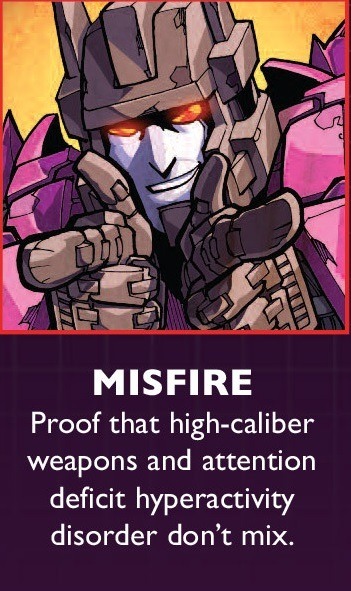 I thought the last rumored list though said Wave 5 deluxes were Misfire, Slugslinger, & Crosshairs?